Singlesticks: Like fencing, but with 3-foot-long wooden sticks. Pigeon shooting: Killing actual birds, not just targets. Jeu de Paume: A tennis antecedent. Plunge for distance: An aquatic long jump. Rope climbing: Actually made four appearances before getting the axe after 1932. 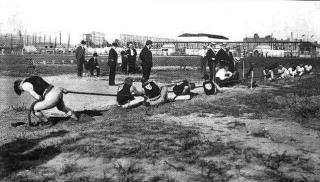 Tug of war: Actually lasted for five Olympics, but got yanked in 1920. Tug of war, believe the Milwaukee Athletic Club are still the reinging olympic champs. Why not have bowling or golf? Both are also events with a definitive outcome and not subjective judging like gymnastics.